I found gold-framed reproductions of these pictures for our home. 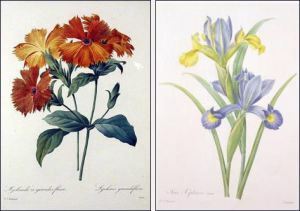 They are “Lychnide à grandes fleurs” and “Iris xiphium”, from Choix des Plus Belles Fleurs, Panckoucke, Paris, 1827, from watercolours by Pierre-Joseph Redouté. The orginal book contains 144 stipple engravings, 13 by 10 inches, and is a rarity worth about $220,000 per copy! Pierre-Joseph Redouté (1759-1840) was a remarkable botanical painter. He was from a Belgian family of artists and from the beginning, Redouté’s talents were recognized by distinguished patrons. He was taught botany by Charles Louis L’Heritier de Brutelle, an outstanding naturalist of his day. Gerard van Spaendonck, flower painter to the King, taught Redouté the technique of painting in watercolor on vellum, replacing the more traditional gouache. In 1786, aided by Heritier de Brutelle, Redouté learned in London the art of stipple engraving and color printing. Redouté depicted fowers with precision and virtuosity, using light and shadow and differing perspectives. The luminosity of stipple engraving is particularly suited to the reproduction of botanical detail. A copper plate is engraved with a dense grid of dots, modulated to give delicate gradations of color. Because the ink lies on the paper in miniscule dots, it does not obscure the ‘light’ of the white paper beneath the color. After this complicated printing process was complete, the prints were then finished by hand in watercolor, in conformity with the artist’s painting. Redouté had, as pupils or patrons, five queens and empresses of France, from Marie Antoinette to the Empress Marie-Louise. Despite many changes of régime, he continue working, contributing to over fifty books of natural history and archaeology, including over 2100 published plates depicting 1800 species of plants. Redouté painted the gardens of the Petite Trianon as Queen Marie-Antoinette’s official artist. During the revolution and Reign of Terror, he documented gardens that had become national property. When Napoleon came to power, Redouté served Empress Josephine’s dream of filling the gardens of Malmaison with the rarest plants from around the world. After her death, Redoutés fortunes fell until in 1822 he was appointed master of design for the Musée d’Histoire Naturelle and Chevalier of the Légion d’Honneur in 1825. Engravings of Redouté’s drawings made in the early nineteenth century are considered to be his best work. They illustrate Étienne Pierre Ventenat’s Jardin de Malmaison (1803-04), Aime Bonpland’s Description des Plantes Rares Cultivées à Malmaisonet à Navarre (1812-17), Les Liliacées (1802-16) and Les Roses (1817-24). Choix des Plus Belles Fleurs from which my two reproductions are taken, is one of Redouté’s last works. It includes spectacular formal blooms, but also more modest wayside flowers.